Twin city of Karnataka, Hubli-Dharwad is a culturally rich town, which offer tourists a plethora of reasons to visit it and makes it one of the most preferred destinations in Karnataka. Hubli is a commercial hub and forms an important centre of trade activities, and therefore, it is often referred as "Chota Bombay." Right from beautiful forested hills to world heritage sites to beaches to temples, Hubli-Dharwad has everything that an ideal holiday destination should have for its tourists. Blessed with so many picturesque sites and monuments, the city never disappoints. From the sightseeing point of view, Hubli-Dharwad can be the best choice of travelers visiting Karnataka from around the world. Tourism in Hubli-Dharwad is at its peak as a lot of tourists are visiting this amazing destination frequently to enjoy their sojourn in the best possible way. Hubli and Dharwad are two different cities, but comes under a single municipal corporation. Distance between these two cities is of just 20 kms, which can be covered easily through a personal vehicle, taxi, or bus. Hubli-Dharwad is a major trading center for cotton and iron right from the reign of the Vijaynagar Kings. The place is equally popular for its handloom textiles and for art and literature institutes. 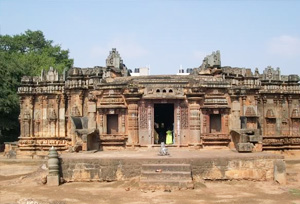 Some of the best places to visit in Hubli-Dharwad are Chandramouleshwara Temple, Banashankari Temple, Nrupatunga Hill, Navagraha Teertha, Indira Gandhi Glass House Garden, Unkal Lake, Siddharoodha Math, etc. The rich past and architectural beauty of this city is something, which can only be felt, if you visit these wonderful places. So, if you are on a leisure trip to Hubli-Dharwad, make sure you visit these places and explore the historical beauty of Karnataka. 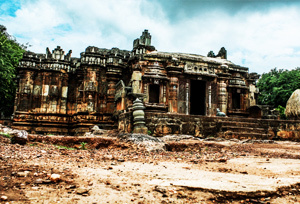 Chandramouleshwara Temple: This magnificent temple is nearly 900 years old, built during the reign of the Chalukyas. It is dedicated to Chandramouleshwara and is carved out of black granite with beautiful sculptures, enhancing the over all magnificence of the temple. Banashankari Temple: This temple is another phenomenal creation of the Chalukyas, who built it in the 13th century, out of a stone. Dedicated to the Hindu deity Lord Shiva, this magnificent beauty is nothing less than a masterpiece, hard to find elsewhere. 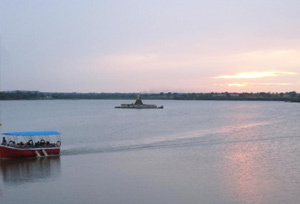 Unkal Lake: This popular lake is spread around 200 acres with a beautiful statue of Swami Vivekananda in the center. It is a very famous picnic spot, surrounded by lush green trees and plants, to give a soothing atmosphere to visitors. The lake is believed to be 110 years old and serves as a great leisure spot. Siddharoodha Math: This famous monastery was established by the followers of Sri Siddharoodha Swami, who believed to have taken his 'Samadhi' here in 1929. This place was frequented by legends like Lokmanya Bal Gangadhar Tilak and Mahatma Gandhi. Till today, this spot is one among the most popular tourist attractions in Hubli-Dharwad. Where To Stay Hubli-Dharwad twin city is one of the major commercial cities in Karnataka, which has cotton and iron trading as its chief business. Also, the city has several ancient buildings and temple, to offer immense scope to the tourists, who are up for a vacation. Hubli-Dharwad has plenty of hotels and resorts, to cater to the needs of its guests in a best possible way. It has luxury hotels, lavish resorts, and comfortable guesthouses, to give a memorable stay to the guests. Here are some of the best options to stay in a peaceful atmosphere in Hubli-Dharwad. By Air: Hubli has an airport, which connects directly to cities like Bangalore and Mumbai. However, one has to take a halt at Bangalore to reach cities like Delhi, Kolkata, Hyderabad, and Chennai. Regular bus service and taxis are available from the airport to reach your desired spot in the city. By Rail: Hubli Railway Station is the nearest one, which connects cities like Bangalore, Delhi, Mumbai, Hyderabad, Chennai, and Kolkata. One can take a bus or a cab to travel within the city. By Road: Good road connectivity from Hubli to other nearby cities including Bangalore, Mysore, Mangalore, Chennai, Hyderabad, and Mumbai.